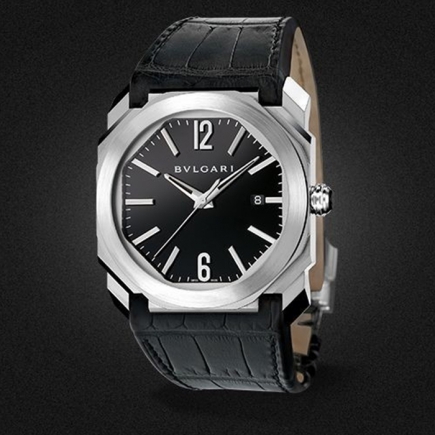 Bulgari | 12'100 € Tax inc. The symbol of the serpent has been a source of fascination since time immemorial. 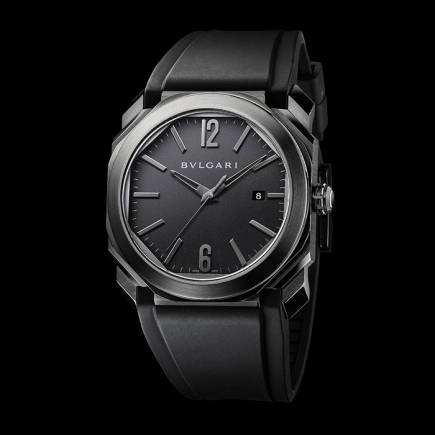 Bvlgari has made the snake its signature since the 1940s, while preserving its iconic and multi-facetted power. 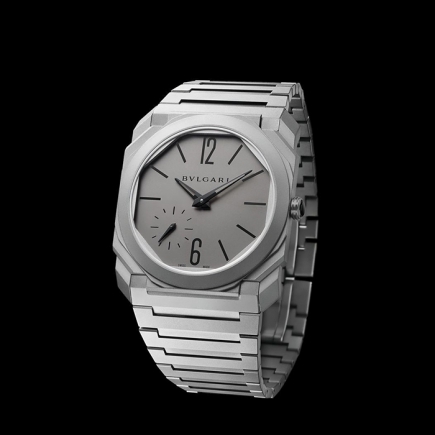 This year Bvlgari is introducing a Tubogas version combining the three classic gold colours: white, rose and yellow. An eagerly anticipated comeback for an interpretation offering a contemporary take on the tricolour creations introduced in the 1960s. The latter confirmed the snake as the cult theme of the Maison, with Tubogas as the House signature. Serpenti has continued to nurture desire ever since. Among the headline models of the era were the famous Tubogas creations combining the precious colour contrasts of gold. 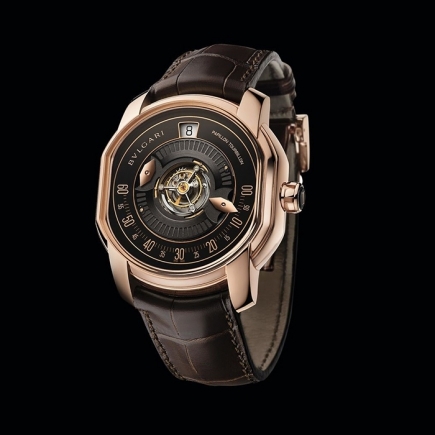 The watch, shaped like a snake head, is in rose gold. Its outline is accentuated by a setting of 38 diamonds and its winding crown is adorned with a cabochon-cut pink rubellite. The dial is elegantly attired with a black opaline base graced with a subtle guilloché motif and enhanced by rose gold hour-markers. 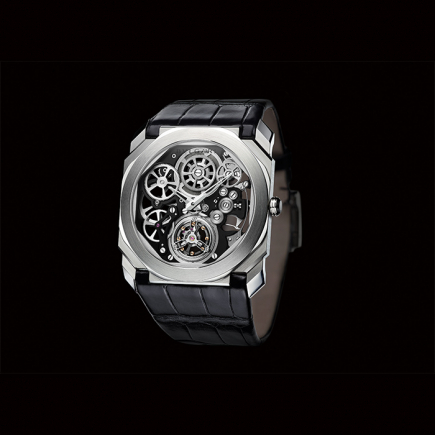 A symbol of perpetual renewal, the possible variations and interpretations of the name are truly boundless. 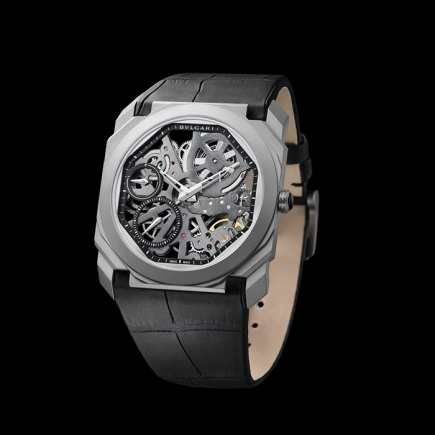 If the new Serpenti were another watch, which would it be? Answer: a Serpenti! 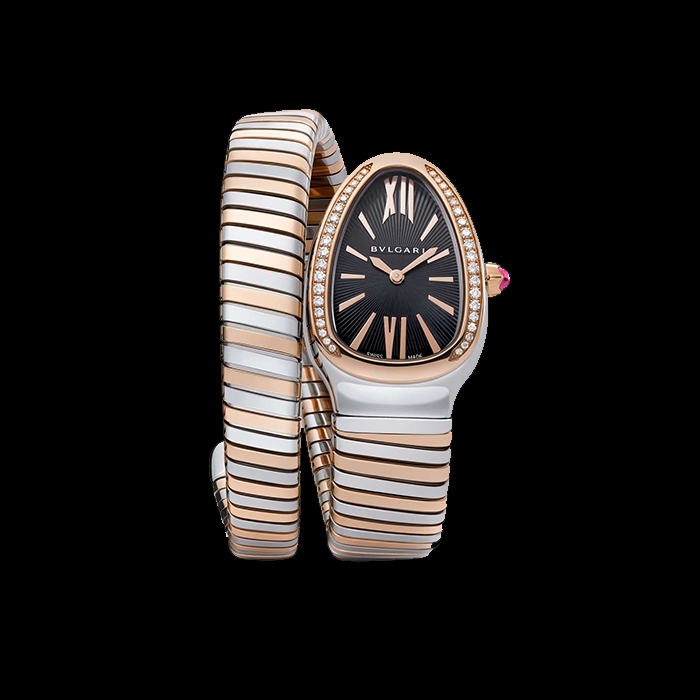 In this Twist version, the watch slips into new ever-changing and supremely personalised ‘skins’ with a wealth of sensual, joyful and colourful leather straps for daily wear; or with a bracelet composed of several dainty rose gold chains, flowing supply around the wrist and enabling the ‘reptile’ watch to express its jewellery transformation. 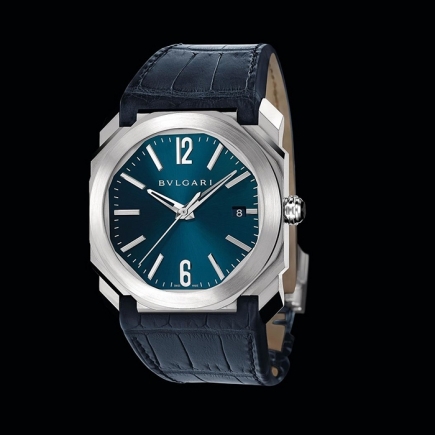 The first new feature takes the form of four-tour straps for two of the models, indigo-topaz blue and wisteria jade, both with shimmering metal accents. These contemporary hues radiate an impertinent sense of chic eagerly adopted by fashion designers, especially in Italy. However, the ultimate colour of the Italian jewellery is naturally that of gold, as the new Serpenti Twist models admirably demonstrate. 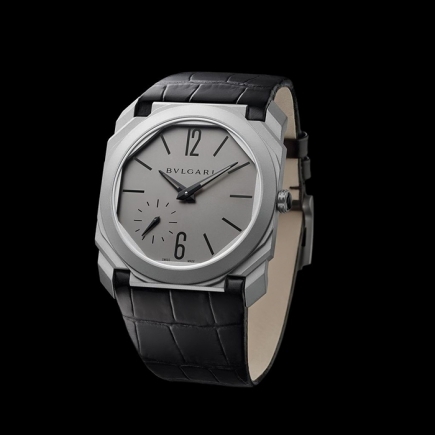 While subtly diverting the classic design codes embedded in its DNA, the age-old snake tamed by Bvlgari wraps itself around the wrist with a double tour golden strap adorned with an antique bronze patina. 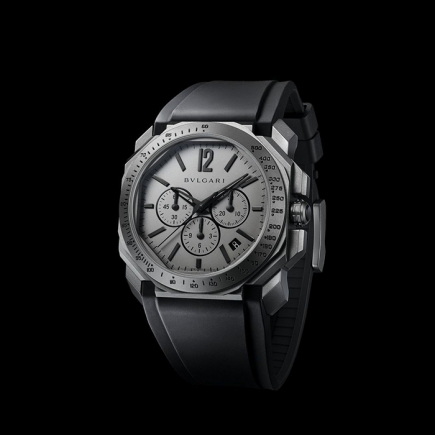 And since these bands are all interchangeable, enabling the Serpenti to be personalised at will, the watch can change its skin yet again. A dainty chain bracelet, with supple articulated links featuring an unusual design, makes it unmistakable precious in the twinkling of an eye. The chain bracelet can be replaced by the coloured leather strap and vice-versa, thereby rendering the Serpenti infinitely playful and customisable. And to further facilitate personalisation, the customer can choose the elements composing her Serpenti Twist on the My Serpenti app developed by the Maison. 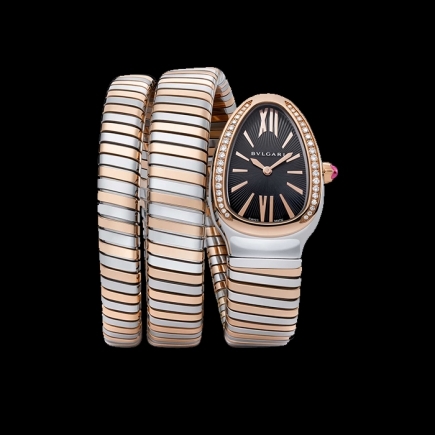 The polymorphous Serpenti sets the pace for the dance of joyful and precious hours. After gold colours and colourful leathers, the theme demonstrates its strength by playing with an unexpected combination mingling technological and precious materials. 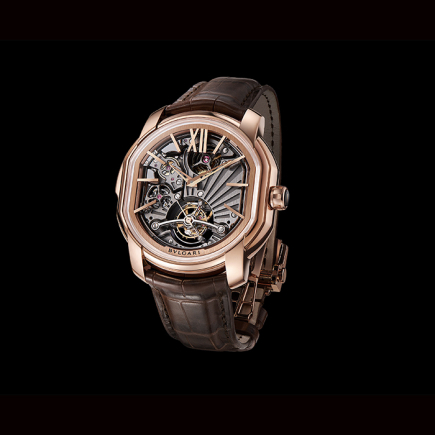 White or black, featuring rose gold inserts, Serpenti Spiga coils twice around the wrist as supply as its metal or leather counterparts - forming a natural extension of the case also set with rose gold and framing a black or white lacquered dial – while asserting a resolutely contemporary tone. 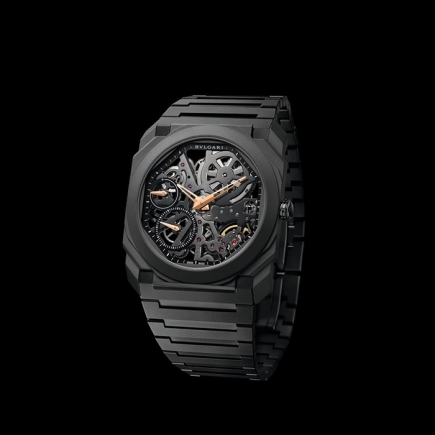 And Spiga also takes its bold approach to unprecedented heights by insolently twining a five tour black ceramic bracelet with 18kt rose gold and diamond accents around the forearm !